In my previous post I promised to share some of the moments that I would consider my personal paradigm shifting moments, or ideas that have changed the way I approach living my life. It’s hard to come up with a conclusive list of such moments, but this one really sticks out in my brain as a game changer. It’s funny how you can trace such seemingly, serendipitous moments back to their origin; a friend introduced me to Josh Garrels, I followed his music on social media, he posted a cover of one of his songs done by Tessa Violet–I watched a series of her videos while vegging out one day, and then she linked to Ze Frank, who linked to Brene Brown’s Ted Talk, and well… four years later here we are. Life. Changed. I initially started watching a YouTube channel by Ze Frank during the winter of 2013. To give a little back story, the years between 2009 and 2013 were a definitive low point in my life. I hope, and pray I will never revisit the kind of lows I reached in my late 20’s. There were a multitude of things that were “wrong” that ranged the gantlet between, health problems, depression, anxiety, dissatisfaction with professional life, disappointment in personal relationships, an overwhelming feeling of stagnation, and in culmination… shame. The precipice of these issues (or at least the one that I placed the most mental angst around) was that I had been in love with a guy for a ridiculous amount of time, and I had never told him. I told myself ‘we were friends’ and that I couldn’t burden him with this information; the reasons I gave myself were a.) I didn’t want to be high maintenance because I didn’t think I was worth the effort (and I assumed asking for anything would qualify me as “high maintenance”) b.) I was afraid to ask because deep down I didn’t really believe that I was even good enough to be his friend. c.) I would rather accept scraps of a pretend situation, than risk confirming my fears (that he didn’t care for me, the way I cared for him), and d.) I felt certain that I valued the friendship more than he did. Shame. It’s something that I’m thinking about a lot lately. I think it came to the light because of the YouTube I was watching the other day from zeFrank. Maybe I was already thinking about it before then because of thinking about talking with him (the guy); but just the fact that I constantly feel like I’m his substitute friend. I feel as though I’m not worthy of being his friend, and it really bothers me that I feel like I’m so beneath him…and the question is why? Why do I feel that way? —where are these roots of shame in my life? Why do I feel so easily embarrassed? The whole needing to get off Facebook? It’s shame. The feelings that he only talks to me because I’m his substitute friend? Shame. I’m not good enough, I’m not cool enough, I should expect the worst case scenario and expect to be disappointed because I’m not worthy of good things happening to me. And if something good has happened, it has to be repaid with some kind of karmic bad. The saddest thing is, so many times, the one we’re most desiring that validation from, may frequently remain oblivious to the idea there is a problem. My guy friend, I suspect for the most part, had no idea that I was living in such dishonesty with our relationship. And all because I was afraid to express vulnerability and be truly authentic with him. What if we tell them the truth, and they reject us? What if the thing we suspect turns out to be true? What if we lay all our cards on the table? Then we won’t be able to pretend like its “all in our head” anymore; then we’ll know for certain. I can’t tell you all the answers, but I can tell you what I discovered. Having a relationship that was built on something less than the truth, was as lonely as having no relationship at all. Watching Ze Frank, during those dreary winter months of early 2013, I found myself feeling empowered to find my voice. I realized that I was living a lie, and that not speaking my truth had become a facade. The so-called-friendship we had wasn’t real from my side, wasn’t truthful, and so it was calling into question the legitimacy of the entire situation. And additionally, it was completely isolating. In my attempt to hold on to the pretend reality, I was becoming aware that it wasn’t a reality at all, just mist in my hands that evaporated on closer examination. Ultimately, a couple months after this video, I ended up writing a three page letter to the guy. Because of where I was at the time, for me, it meant ending the friendship (I undfriended him on social media, and took a complete leave of absence in his life.) I wish I could say it made me feel immediately better; it didn’t. It was painful and difficult, and I confess, I hoped that he would reach out to me. He did not. While I hold few regrets, I do at times wish I had been in a place in my life where I could accept his rejection without needing to cut him out of my life. I wish I could have had the simple conversation, of “hey, I like you, you like me back?” and if he’d said no, that I could have shrugged my shoulders and carried on without freaking out. I simply wasn’t in the place to even consider that in anyway whatsoever. I also wish I could tell you, that the friendship weathered that, and ultimately it came back. But it didn’t. As of this time, our friendship has never came back, but I got to go forward. It became the end of that chapter, but it was the beginning of something new in my life. It was the beginning of me believing in my own worthiness, respecting myself enough to ask for what I need and want, and beginning to truly pursue living an authentic life. I think of him from time to time, and you should know, I hold no bitterness in my heart, and only wish him the greatest of joy. 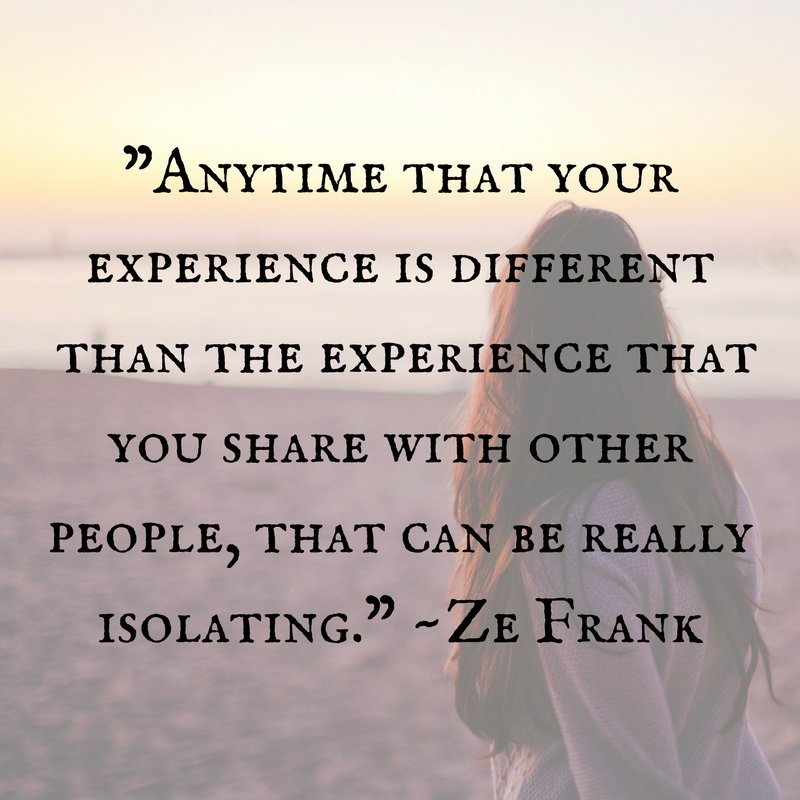 The life-changing lesson in Ze Frank was, having the honest conversation with others is hard, but doing so does feel realer. And Ze Frank was right; whatever the worst you’ve imagined happening, probably won’t happen. It may not be easy all at once, but ultimately truth is freeing. In my case, it meant the end of such conversations with this guy, but the beginning of many more conversations both with myself (and with other wonderful guys I’ve dated since.) And there was also a gift in an ending; the greatest thing I feared was that I would lose him. And I did. But in doing so, what I realized was it wasn’t the worst thing ever; it was bad, but it was a bad that I could survive. Being brave made me realized that I was resilient to pain. My story isn’t the only story. Many times, such conversations won’t be the end of something. They will simply be a new starting off point, where you and the other person, can begin a new and updated version of your story. Maybe it’s time to update your relationship-software to the 2.0 version? Either way, you can’t spend your time obsessing about what will come as a result–instead, as Ze Frank says, focus on the thing you need to say to bring yourself and your relationship into authenticity. And realize, if you choose not to, you’ll likely find the system crashing continually. Knowing what I know, (that it might mean the end of something) I would still say, without hesitation; If you find yourself living in a reality that isn’t matching up with those you love, don’t run, don’t try to con the person into being what you want. If you need to have a conversation that brings your relationship into the light, have the conversation. You are worth asking for what you need, you are worthy of taking up space; if you need to have such a conversation, realize that being authentic is one of the bravest things we can do. You can do it; be brave.